Looks authentic. Able to pair with b&o app. Received item today. That’s fast for oversees delivery so that was good!! Yet to try but I have used other products from the brand so I expect nothing but the best!! Original product received within 5 days highly recommend. Highly Recommend fast delivery compared to first order. item as delivered. thank you. fast delivery compared to first order. item as delivered. thank you. came in 5 days time. Had to get used to touch panels since left & right got diff fn. Battery life is as stated. Way cheaper than retail price but no warranty. Download the b&o app, it rly makes it sound better! Good delivery service provided by qoo10. Product was in great condition. Brand new set. All is good. Working fine. So far so good Ok not bad can try again. Thank you very much. Item is much cheaper than buying locally but you gave up on convenience of warranty in return for that. Pros and cons, just gonna weigh it accordingly. Feedback from my kid....this model has connectivity issues. Soundwise is great! It arrived safely. Yet to try but it looks good. received within a week in good condition. great price. Is E8 2.0 happening soon? Hi, is this compatible with iPhone 7? Are you restocking pink version soon? Where to get the $20 coupon? Please advise if i can get a one-for-one replacement for this as it is still under warranty, and how do i go about doing this? May I have your order# for checking? 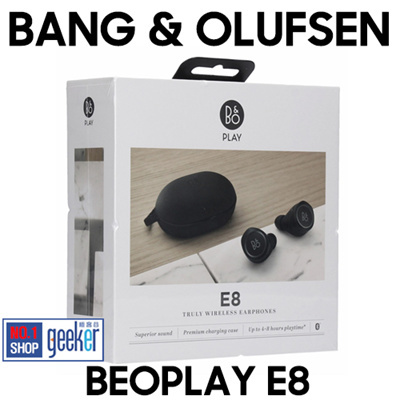 May i know if you could try 1) unpair the earbug with phone AND 2) unpair earbuy in B&O Apps and try pair again BOTH? AND may i double check if yr E8 has been updated with latest firmware version !? Ambient will fully mute the music, while the other two, Social and Commuting, will simply reduce the volume of the playback. May i know if u are using Social / Commuting level thus u still hear music ?